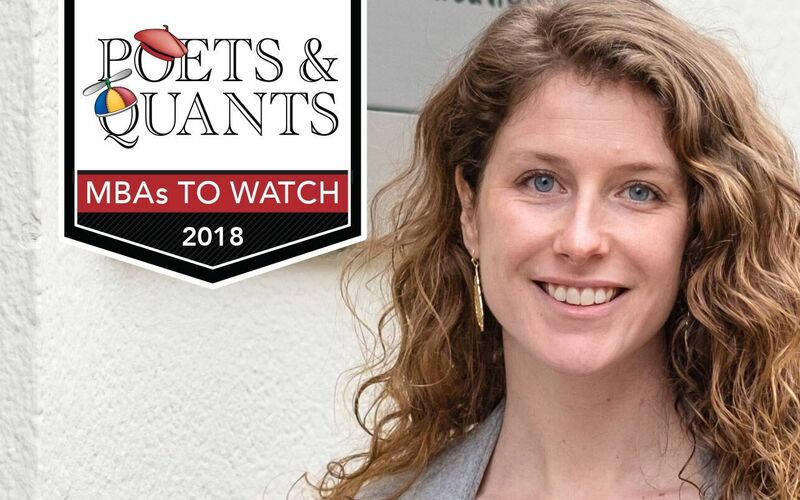 Allison (Allie) Whitefleet has been chosen among Poets & Quants Top 100 MBAs to Watch in 2018. Fun fact about yourself: I lived in the Atacama desert for two years, the driest desert in the world. Where did you intern during the summer of 2017? Community Work and Leadership Roles in Business School: I was granted the IE/Fulbright full scholarship for the MBA program. With only one term worth of published grades as a reference, I will be at the top of my class (Honors / Beta Gama Sigma) if the grades remain consistent. With such a short time here at IE in an intensive program, I haven’t taken on leadership roles the way I did throughout my undergrad business degree. However, I am currently the class representative for my Tech Lab section. Otherwise, I have been active about attending many talks and club meetings on campus for Net Impact (social responsibility in business club), Block Chain Club events, Consulting Club, and other tech talks. Off campus, I have participated in design thinking events in Madrid and will attend an OpenIDEO Design Challenge workshop in two weeks, “Circular Design: Applying Design Thinking to Social Challenges.” Further, I intend to apply with a team to the IXL Innovation Olympics Case Competition in April with a team of classmates. Which academic or extracurricular achievement are you most proud of during business school? So far (we’re only half way! ), I’m most proud of being first in my section after the first academic term. I came to the MBA feeling I’d be at a disadvantage compared to classmates with a strong finance or pure business background. I was nervous about how my non-profit/social enterprise experience would stack up against the others and it was really surprising (and encouraging) to learn that I was first in my class. What achievement are you most proud of in your professional career? I am most proud of my work transforming the development and communications departments of the local Habitat for Humanity office that I worked at. There were many projects undertaken in a short time, but the most notable were: (1) single handedly converting the affiliate to a new website, database, and donation platform; and (2) successfully implementing brand three new crowdfunding programs. Who was your favorite MBA professor? Marco Giarratanar, Strategy – Marco’s classes were an expert example how to be structured, engage the class, and use innovative techniques all combined. Not only were his lectures always well-designed and communicated, but his sources, activities and examples were different than the norm. I simultaneously learned a lot and enjoyed the experience of being in such a dynamic class. What was your favorite MBA Course? Innovation in a Digital World stands out as one of my favorites so far. The topics continually touched on practical examples of using technology and innovation to enhance business. I appreciated that the emphasis was not only on tech tools, but also on ideologies and methodologies. It was interesting to learn about tech trends, of course, but why this class was a favorite is more because of the focus on business-wide strategic decisions involving tech, the practical realities (and challenges) of implementing tech and innovation changes, and a look at these tools across all industries, not just the common ones that come to mind. Why did you choose this business school? In all honesty, IE chose me. I was in the process of applying for Fulbright grants to do research in Spain when I discovered Fulbright’s partnership with IE. After doing some research about the school, I jumped at the opportunity to do the MBA program. I was most interested in the opportunity to study with such a diverse group of students, the ability to do the program in one year, and IE’s emphasis on innovation and doing things a little differently (“out of the ordinary”). As someone with an “out of the ordinary” background for an MBA program I was drawn to the school. What is your best piece advice to an applicant hoping to get into your school’s MBA program? This may sound cliche, but the true answer is: Be yourself. IE is serious when they say they value diversity and that means all kinds of diversity whether it be from your nationality, your professional background, or your interests. There is no need to pretend to be a certain kind of professional or profile when interviewing. You cannot have an innovative environment and stand out as an entrepreneurial MBA if you’re recruiting for one profile – so remember this and just embrace the story that has led you to study an MBA. What is the biggest myth about your school? That the workgroups will be the biggest challenge, and working with people from all over the world will be difficult and frustrating when it comes to group projects. Although there is some truth to the fact that there are cultural differences, I had great experiences in my workgroups and in the end it was not nearly as difficult to navigate as some had said. People work differently from one another even all from within the same country so it’s a valuable skill no matter where we end up. Maybe I got lucky, but my work group teams ended up being an enriching experience all around. What was your biggest regret in business school? Choosing a one year program! Although there are clear benefits to being able to do an MBA in one year vs. two, I often feel like studying for two years would have made a world of difference in terms of being able to engage further on certain topics, have a little more time to dedicate to each task or class, and especially in the realm of career exploration and internship opportunities. Which MBA classmate do you most admire? David Fuente – David is a father of three children (one of which was born during the MBA) and is one of the most dedicated students and caring classmates even despite his commitments outside of school. He was involved as much, if not more than, all of the rest of us. He is hard working – an engaged classmate, with a positive attitude, and a great sense of humor. I don’t know many people that could perform at such a high level, in such good spirits under similar circumstances. On top of all of this, he was always inclusive and cooperative amongst his peers. As a Madrid native, he offered his knowledge and resources as a local to our class often. Who most influenced your decision to pursue business in college? I can’t name one particular person who influenced my decision, but maybe society in general would be accurate. When I was a senior in High School deciding a major choice, I clearly remember thinking I didn’t like that business was seen as a male-dominated field. I didn’t have a clear picture of what it would mean to work in business at that time, but I remember thinking I wanted to be at an executive level someday, to be where the decisions were made. If you were a dean for a day, what one thing would you change about the MBA experience? More opportunities to interface with companies to have meaningful contact. I would explore incorporating these things even more as a direct part of the curriculum rather than as parallel career support services. In one sentence, how would you like your peers to remember you? As a good friend and someone who brought different perspectives, a positive attitude, and engaging ideas to the program and our classes. What is your favorite movie about business? Moneyball – Of course, the importance of data analysis to support business is a main lesson from the movie. However, a bigger takeaway for me was the example of taking a stand, with conviction, to do something bold and innovative. Favorite vacation spot: My all-time favorite vacation spot is my hometown beach where my grand parents live, Long Beach Island, NJ. Hobbies? Well before the MBA when I had time for hobbies, I had just gotten into ceramics (pottery) and was loving the classes. I’d like to continue with it again once I have a more steady routine. I was also a runner in high school and have maintained the sport as a hobby as an adult…as I’ve moved new places, it’s been a unique way to get to know a city better. What made Alliesuch an invaluable addition to the class of 2018?